Salicornia maritima and I go way back. Way, way back, all the way to my childhood in the 1970s. We first met when I was probably six or seven years old, when my family and I dug clams in Great Salt Pond on Block Island, a little island off the coast of Rhode Island. Hard shell clams, the quahogs, lived in the sandy shore off the beach. But soft shell clams, the steamers, lived closer to shore, where there was a little more mud. An especially good place for steamers was right where a little spring emptied into the bay. And stretched out alongside the runoff of that spring was a gigantic bed of what my family called saltwort. I remember munching on the tips of this plant as a boy, and loving the salty, crunchy brininess they had. It was like eating low tide — if low tide didn’t stink of rotting seaweed, fish and crabs. Years later, on my honeymoon (yes, I was married for a time), I found that patch again; I was happy to see it had survived for so long. I introduced my then-wife to saltwort, and I remember her liking them. I did the same with Holly when I finally got a chance to take her to Block Island. Holly likes saltwort, too. It was only when I began writing about foraging that I discovered our family’s name for this saltwort plant was fairly unusual. I also learned that this is a vegetable of a thousand names: sea beans, sea asparagus, samphire, glasswort, chicken feet, etc, etc. 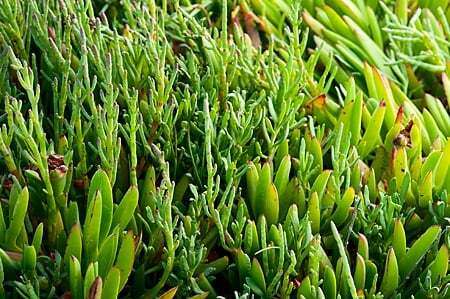 Probably its best name is salicornia, as all the various species of this salt-lover are in the genus Salicornia. Its many names are partly an outgrowth of this plant’s universality. It will grow in protected salt marshes wherever they are found, on all continents except Antarctica. Most people think of salicornia as a seaside thing, and, yes, it is most common at the shore. But species of this plant grow widely in the alkali marshes of Utah and the rest of the Great Basin, near salty springs in upstate New York, and in the alkali marshes in Manitoba. Once you spot salicornia, you will never forget it, or mistake it for anything else. It doesn’t look like it ought to be eaten. The plant looks (and is) prehistoric: no leaves, just a sprawling, succulent series of many-jointed fingers reaching for sunlight while their feet are bathed in sand and salt water. Oddly, however, salicornia would rather be in your garden. You can buy seeds for it, and I grew it one year. The plant loses a lot of its salty tang in sweet soil, but it grows much larger and fuller than it does in the salt marsh. Apparently salicornia has staked out terrain otherwise inhospitable to other plants as its favored growing spot. Why it cannot compete with other plants in nicer neighborhoods is a mystery. 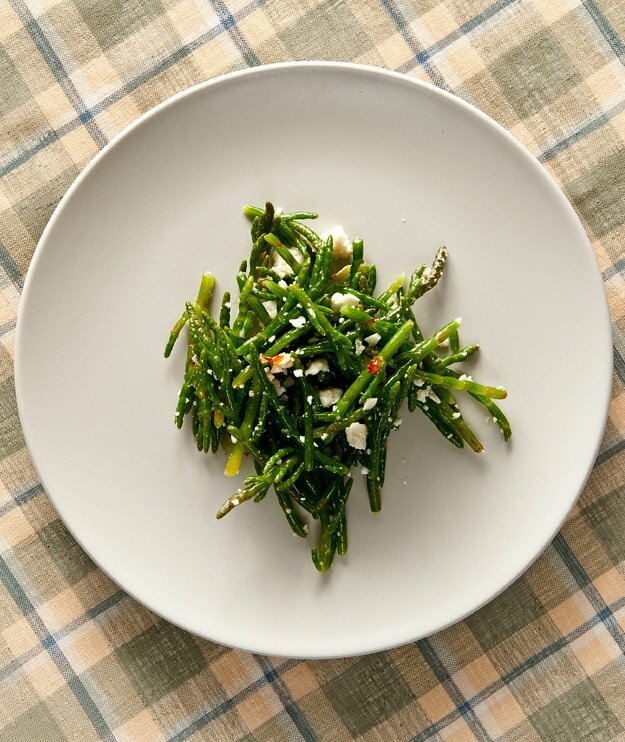 Many of you already know about sea beans, which is the newest, trendiest name for salicornia; by most accounts, the “sea bean” moniker is an outgrowth of the restaurant trade. Salicornia is in no way a bean, but it does have that nice snap like a good green bean. You can buy it in many farmer’s markets along the coasts and in major cities. Raw, salicornia is crunchy and very salty. (I even make an herby, natural salt from dried, powdered sea beans) It can be tough to properly clean the little stalks though, so I blanch the plant in boiling water for 30 to 90 seconds, then shock it in a bowl of ice water. Once you have your blanched sea beans, all you really need to do is dress them with your best olive oil and add a little lemon juice, balsamic vinegar or other acidic component, plus a few grinds of black pepper. Do not cook salicornia for more than a few minutes, or it will get flabby, and the crunch (as well as the salty hit) is really what this vegetable is all about. Look for saltwort between March and September, and pick only the top few inches of the little plant, which can get bushy over the years. Try to avoid the reddish stalks, as they are often tough. You want the parts that are the most tender: The bottoms of the plant get woody, and a little silica thread grows up the center of the stalk over time that strengthens the plant, but acts like dental floss if you eat it. Try not to walk right through a bed of salicornia, as you will break it with your footsteps. Forage around the edges. Once you collect your sea beans, put them in a plastic bag in the fridge with a damp paper towel around them. They will last more than a week that way. Once blanched, they freeze well, too. 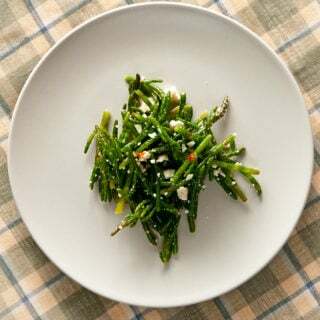 Salicornia, sea beans, samphire, whatever, are a perfect salad green. Mostly gathered along salt marshes, this plant is naturally salty and very crunchy. It can be bought from March to September, depending on where you are, but early summer is the best time to play with this veggie. Most people don't like raw salicornia, and I prefer it boiled for 30 to seconds, then shocked in ice water: This removes some of the salt, and sets that pretty jade color. You can then eat the sea beans as-is, or quickly stir-fry or pickle them. This is a simple sea bean salad, dressed with really good olive oil, chile, garlic and a little lemon juice. A crumbly cheese like feta or a Mexican cotija adds some richness. Bring a large pot of water to a boil and cook the sea beans for 1 minute. Transfer them to a bowl of ice water to cool. Let them rest a few minutes. Lay out a tea towel or other cloth towel. Pick through the sea beans to remove any stray bits of seaweed, and to remove any discolored bits or woody bottoms. Use only the top 2-5 inches of the plant. Lay the cleaned sea beans on the towel to dry. Pat the sea beans dry and toss with everything but the lemon juice. Add lemon juice until the salad is as tangy as you like it. Serve cold or at room temperature. This will keep in the fridge for a couple days. 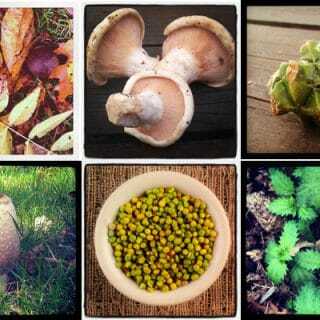 Find help identifying, finding and harvesting all sorts of wild edible plants here on Hunter Angler Gardener Cook! Kim: No, because I blanch them in fresh water, not salty water like you normally would.